In order to develop a secure defense against a hostile alien race's next attack, government agencies breed child geniuses and train them as soldiers. A brilliant young boy, Andrew "Ender" Wiggin lives with his kind but distant parents, his sadistic brother Peter, and the person he loves more than anyone else, his sister Valentine. Peter and Valentine were candidates for the soldier-training program but didn't make the cut — young Ender is the Wiggin drafted to the orbiting Battle School for rigorous military training. Hugo and Nebula Awards Winner. It was a great book. The mean character is Ender plus he had to go battle the buggers and kill all of them but he got very up-sad about killing all the buggers. It was not a game as the teacher thought him the game was a war. Ender won't to go home but the school don't least him go home. You should read the book. 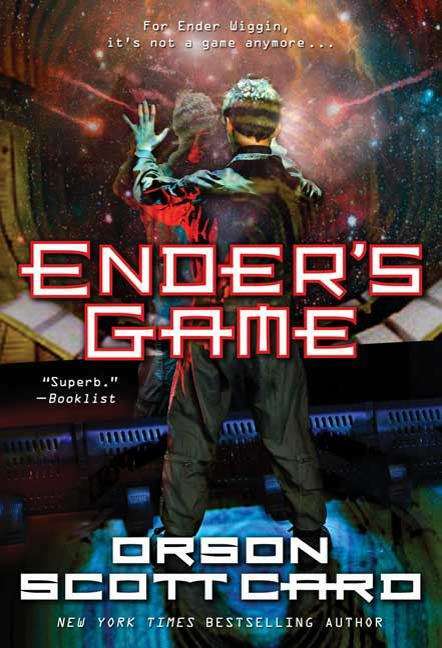 Ender's Game is high interest fantasy/science fiction. I've been using it in my English III and IIIAP classes for over 10 years. Many of my "I hate to read" students tell me this is the only book they have actually read...and many have followed up by reading the sequels. The book has many themes that relate to social and political issues of our day -- including whether or not "real life events" ever require an individual to sacrifice his/her own desires for the greater good. Definitely a 5 star book, from an experienced teacher's point of view!